A person looks on at Greenland’s ice during a 2017 NASA campaign. A team of scientists is warning that the double whammy of a naturally recurring weather pattern and rising temperatures is triggering dramatic melting on the Greenland ice sheet—a problem the researchers liken to recent global coral bleaching events, which have been fueled by the one-two punch of El Niño and climate change. The research, published Monday in the Proceedings of the National Academies of Sciences, examined the giant northern ice sheet’s slim-down from 2003 to 2016 using data collected by NASA’s Gravity Recovery and Climate Experiment (GRACE) satellite and by a network of GPS stations. 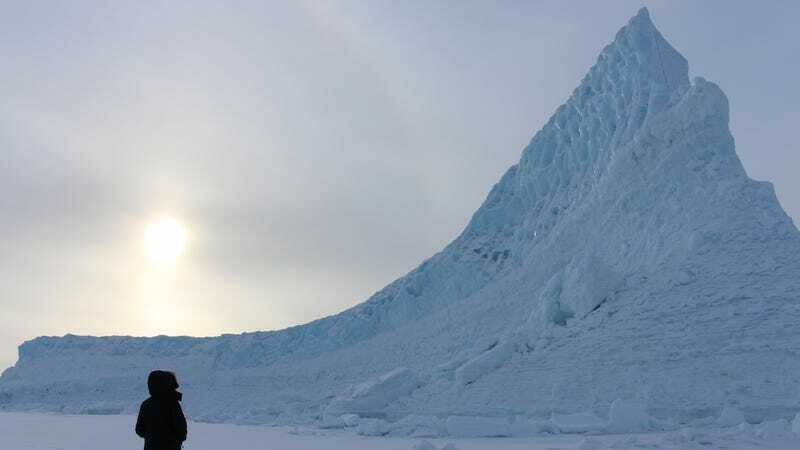 Over the course of a decade, the scientists documented a four-fold acceleration in the mass of ice lost across Greenland, from 102 billion tons a year in 2003 to 393 billion tons a year in 2013. Then, all of a sudden, something caused Greenland to press pause. The ice losses ground to a near-halt for 12-18 months, before accelerating again. University of Colorado glaciologist Mike MacFerrin, who studies meltwater on Greenland’s surface, agreed with the new paper’s conclusions. He recalled visiting Greenland in the spring of 2012, when the NAO was in a deeply negative phase and a massive high pressure system had parked itself over the ice island. “We...watched with horror as meltwater and runoff overwhelmed all previous records in the scientific record of Greenland,” MacFerrin told Earther via email. Mountain glaciers are also disappearing. In the western U.S. and Canada, these small-but-regionally-significant chunks of ice are melting four times faster than they were a decade ago, per a study out last week in Geophysical Research Letters. Then, at the bottom of the world, there’s the big kahuna—nearly 200 feet of global sea level rise locked away in the frigid wastelands of East Antarctica. A study published last week in Nature suggested that even this frozen fortress is starting to weaken. This article has been updated to include comments from Mike MacFerrin.